You are currently browsing articles tagged funding. Happy October everyone! This month marks our one month of school. If you ask any non-freshman student, we’ll tell you that it simultaneously feels like we JUST started school and that we’ve been here forever. Many things are still relatively new – we’re still getting the hang of balancing our new combination of assignments as well as establishing an organization and studying method curtailed to this semester’s classes – however, academia has been a critical part of our lives for so long that these activities seem second nature to us. I had my first midterm of the semester this past Wednesday night so I’ve spent the majority of my free time preparing for my first of three exams for Math 18 (i.e. going over class notes, class worksheets, homework, and additional practice problems). Normally, midterm tests are held during scheduled class times, but math exams, for whatever reason, are typically held during the evening. My midterm was scheduled for 6-7:30pm but I had my Aesthetic & Interpretive Understanding 50: Literature and Medicine section from 5-6pm. There are strict attendance policies for my Lit & Med class (they’ll deduct from your grade if your absent! 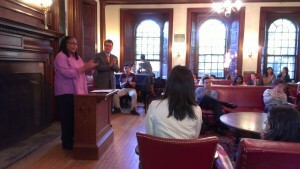 ), but know that flexibility indeed exists within the rigid structure of Harvard. I emailed my TF (graduate student Teaching Fellow – essentially the same as a TA at most other schools) a few weeks before my math midterm asking for permission to either leave early or to attend a different section for the week of my math exam. She allowed me to leave a few minutes early which was probably the best part of having a math exam! Despite all my extensive review for the math exam, I didn’t really know what to expect and was somewhat nervous going into the test. It’s a new class this semester, so there are no reputations like “exams are tricky” or “exams are essentially the practice tests” to help build your expectations. I felt pretty good during the test though and felt even better after it – because it was over! I immediately felt the post-midterm laziness (that I’m still suffering from)! I spent the rest of the night talking to friends, catching up on my comedy television shows and getting excited for my sorority’s fall formal. It feels like I haven’t been academically productive in a while, but I can tell you about the productivity in other aspects of my life! In preparation for the Boston Half Marathon 2012, I’ve been trying to run longer and longer runs. Thank goodness I have the Charles River and the Esplanade to run along, but on certain days, ~10 miles can feel like much more even with my pumping iTunes beats. One of my best friends (who I traveled Europe with this past summer!) is currently training and fundraising for the Boston Marathon 2013 by making an extra effort to run all throughout Boston. I took advantage of her creative routes by running with her into Chinatown where an elementary was holding a fair with cotton candy, photobooths and carmelized popcorn! 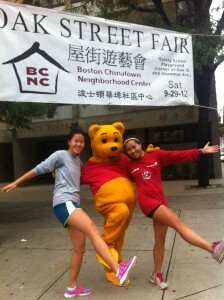 We even met (and danced with) Pooh Bear! 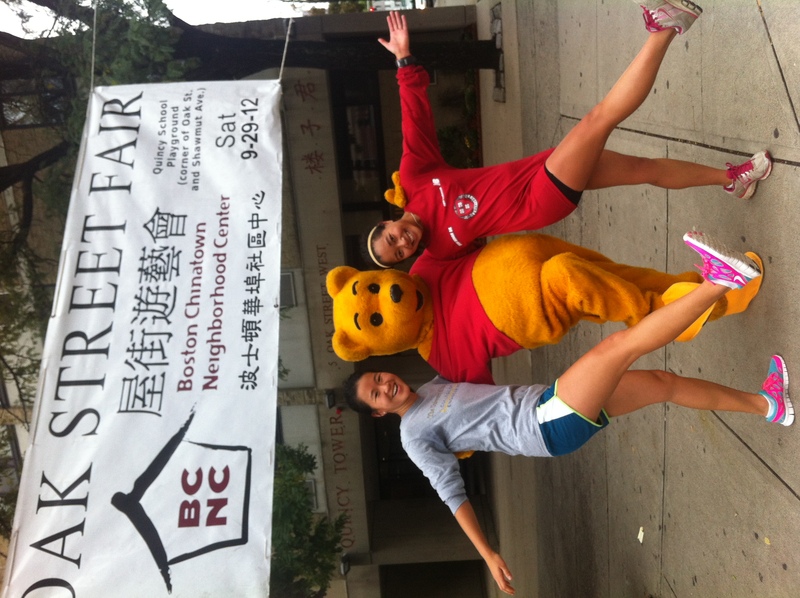 This long run throughout downtown Boston and eventually ending up in Chinatown made the time pass by very quickly. 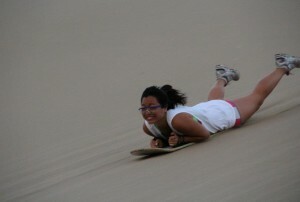 I love when (physical) productivity effortlessly blends in with new, fun experiences! I’m definitely looking forward to being more adventurous on my runs by being more willing to deviate from the riverbanks. Next weekend, I’ll be running the Boston Half Marathon for my second time. I’m feeling pressure to beat my time last year but I think this is only possible if the rain gods have some mercy and cancel the predicted rainy forecast! Another long term project I’ve been involved with since my freshman fall semester is called BRYE (Boston Refugee Youth Enrichment) Teen. This is a program I direct through PBHA (Phillips Brooks House Association), essentially the central hub of public service work on campus. The teen program runs once a week, on Saturdays, at a Vietnamese Community Center located in Dorchester, where (recently) immigrated students gather to work on homework, supplementary lessons we’ve created, arts & crafts, and we often strive for field trips to museums/Harvard’s campus. This is my second year directing the program and I feel like this year will be easier than last, not only because my previous experiences will help me solve future problems with much more skill, but we’ve received a lot of generous financial assistance to run the program this year. At the end of the 2012 spring semester, I applied to the Presidential Public Service Fund (PPSF) grant to alleviate some of BRYE Teen’s accumulated deficit – a heavy burden that started before I became a director. Luckily, BRYE Teen received this generous grant as with a handful of several other programs (see the university’s generosity here!). PBHA partnered with Dean Evelynn Hammonds for a reward reception where program directors gave a short summary of their programs’ goals in exchange for a hefty and generous check. It’s so rare (and difficult!) to unite 20+ PBHA program directors and hear about their passionate work so it was really a beautiful event to attend. I know that my program, BRYE Teen, would have great difficulties running without these funds so all my volunteers and participants are eternally grateful for this financial support and encouragement! Needless to say, it’s been a phenomenal week! There are no classes held on Columbus Day, so the long weekend is looking extra marvelous. I don’t have any midterms this coming week, so I’m looking forward to doing some learning without intensive pressure! 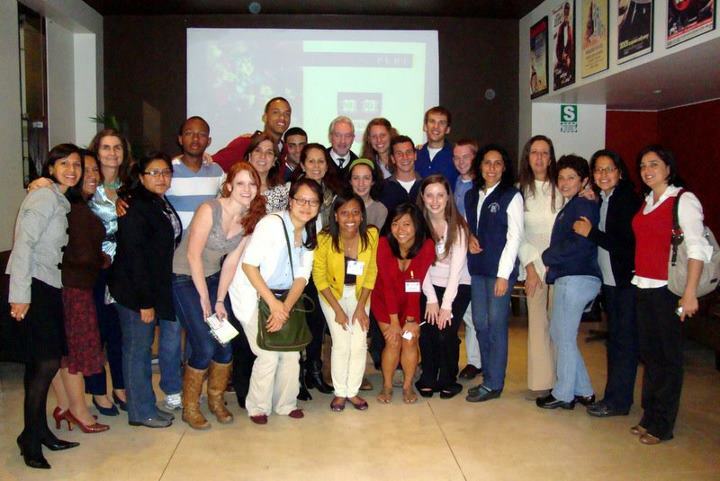 “Summer internship” is a loaded phrase; its contrasting connotations blend splendidly together – especially under the umbrella of the David Rockefeller Center for Latin American Studies (DRCLAS) organization. As mentioned in my previous blogs, I’m participating in the DRCLAS Summer Internship Program (SIP) for the majority of my jam-packed summer. The first week oriented the 13 participating students in Peruvian history, culture, and safety which essentially tried to eradicate our touristy characteristics (i.e. taking group photos in front of ALL churro stands) – whether or not these efforts were futile is still vehemently debated to this day. Orientation week ended with a cocktail mixer with our bosses. Program student participants, coordinators & partners! The program felt surreal up until the moments we awaited for our bosses to arrive. Most of us, at this point, never had personal contact with our bosses and had no idea what we would be doing for the next 7 weeks. 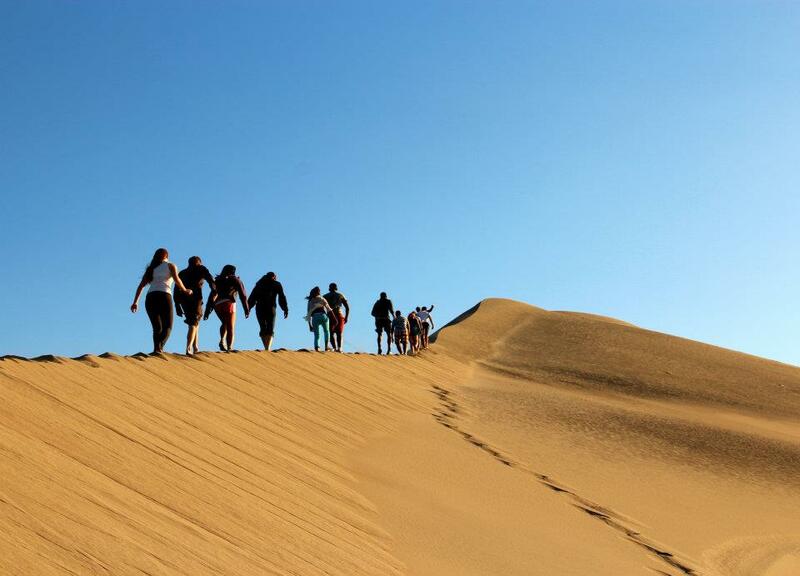 A Peruvian company name was enough for us to purchase a round trip ticket without hesitation! The anxiety concomitant with jet-setting to a foreign country without complete job security rose and climaxed when we realized conversation icebreakers had to be in Spanish. Avoiding awkwardness in English is already almost impossible for me as it is, so I patiently awaited my boss as I perused my arsenal of knowledge, mentally recounting Spanish books and movies from class so I could quickly relate to them if the conversation lulled. Thank goodness Melvin, my Peruvian boss, is suave enough for the both of us. We discussed the logistics behind shadowing at the clinic, ceviche, chocolate, and before I knew it, the program coordinators declared a final toast so that no one had to travel home during an obscure hour. My excitement about my shadowing internship carried over for days! Melvin and I had made plans for me to start my internship early in order to meet the majority of the doctors at the clinic as well as get my uniform customized. He said I would have full reins to observe whatever I wanted in the clinic and he has definitely kept his word to this day. 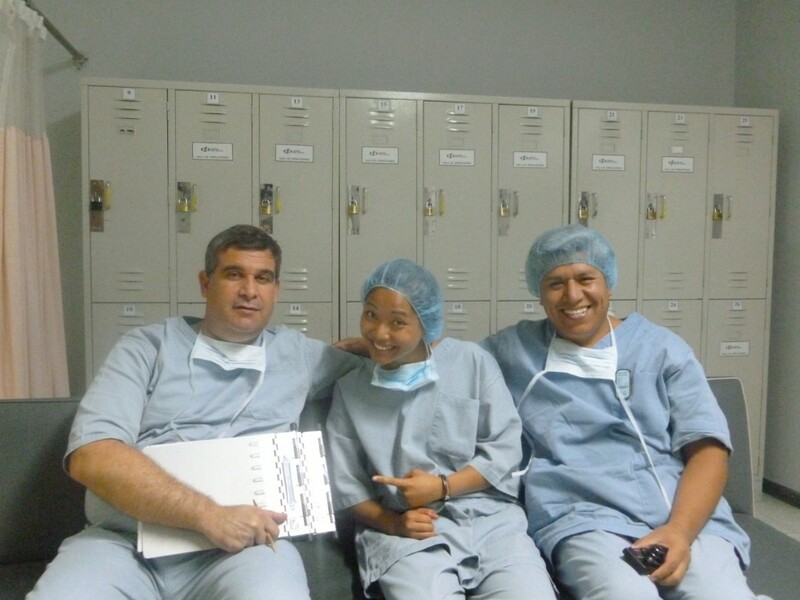 On my first day at the clinic, I was ushered into the operating room of a brain surgery!!!!! Yes, all these exclamation points are necessary. Me in the middle of a surgeon sandwich! I’ve seen human brains before – at science camp (and on Grey’s Anatomy!) – but they’ve never been attached to a beating heart. The patient was a teenage boy and it would be his 4th brain surgery within the year. He had an aggressive brain tumor and an aggressive team of talented doctors to match. As I loomed over the shoulder of the neurosurgeon and watched as the patient’s head was shaved, a lot of conflicting emotions erupted from the core of my stomach. Before this shadowing internship, I thought shadowing was a stupid waste of precious time because I’m more of a hands-on person. However, all the Mather (my upperclassman House/dorm) premed tutors/advisers strongly recommended shadowing. Since it was difficult for me to find time during this past academic year, I was beyond elated to not only receive the opportunity to shadow and simultaneously practice Spanish, but also acquire generous funding through the Office of Career Services (OCS) [see “International Internships and Funding” in the hyperlink]. I never thought I would stand inside an operating room in action before the third year of medical school. The fact that I’ve already had this experience as a rising undergraduate junior blatantly demonstrates how Harvard and its resources effectively provide a catalyst to jumpstart as well as support students on their career paths. Reid, in her more recent blogs, mentions how grateful she is to be studying abroad in the country known for love and food. I couldn’t agree with her more. 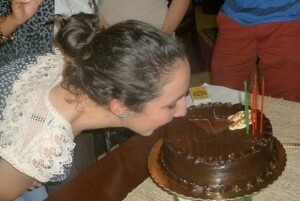 Peruvian tradition calls for the birthday person to bite the cake before cutting it. 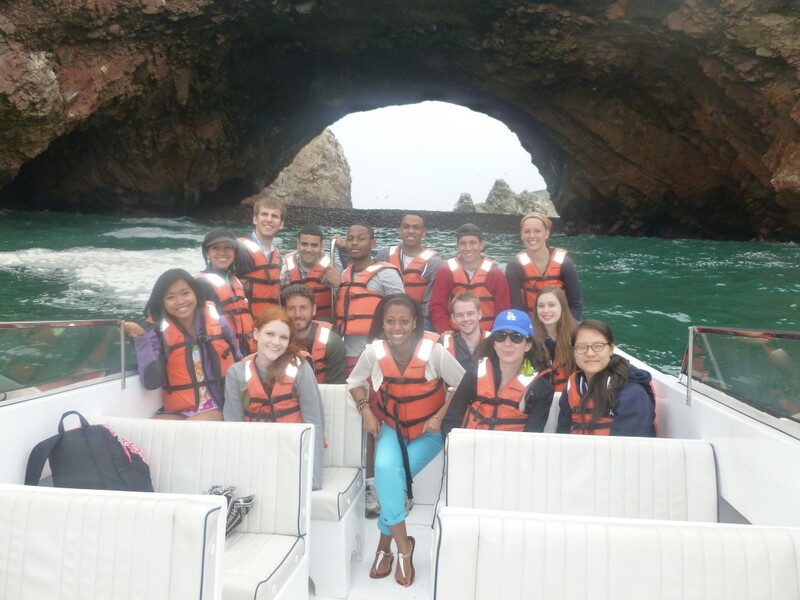 On the second Friday of the program, DRCLAS organized a tour through Paracas and Ica. In Paracas, we boarded a boat headed to the Ballestas Islands. The caves and rock formations were carved by sea, wind, and weather! 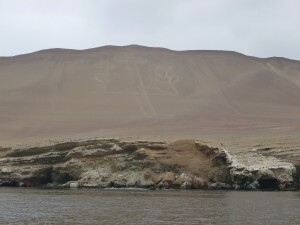 This steep hillside encryption can only be seen on boat. Its origin and function remain as mysteries! After lunch, most of us spent the best $8 of our lives. 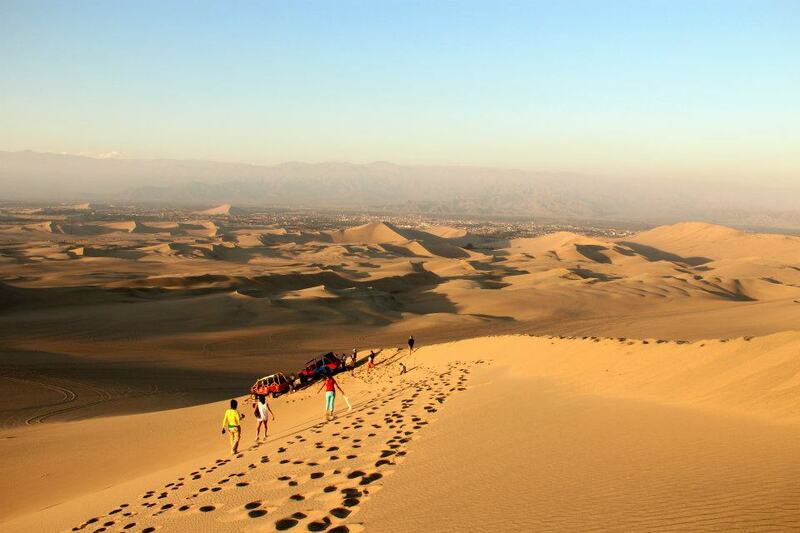 Literally right next to the lunch restaurant were miles and miles of seemingly endless Huacachina sand dunes where we sandboarded down steep, STEEP slopes! Just a few hours ago, we were on a boat! This past week was phenomenal. I can say this fairly because bad events occurred as well, but ‘tis life – nay – ‘tis a great life because I’m perfectly ecstatic with how things unfolded. As I’ve stated (desperately) before, my well being was basically dependent on whether I go abroad this summer. At this point, I truly can’t think of any better way to improve my Spanish proficiency other than forcing myself to think, breathe, speak, and eat Spanish. I’m more than happy to report I’ll be doing all of the above for 8+ weeks this summer! I’ve been scrambling to research and apply to many summer opportunities (including research and interning abroad) ever since my return to campus after J-term (January break/winter break) – so much so that it felt like a fifth class! Being a research assistant at the Harvard Decision Science Laboratory, which is more of a social science lab, has really made me miss wet labs (pipettes, microscopes, etc.). This isn’t to say I don’t like my job there because I definitely do and intend on working there for many more semesters! Seeing the economics/psychology behind so many common, daily tasks (such as first impressions) has truly propelled my curiosity. Nonetheless, wet labs were my focal exploration point throughout high school and this is an area I feel like I’ve been failing to pursue during my precious and fleeting time as an undergraduate. Therefore, I applied to various REU (Research Experience for Undergraduates) programs at universities and companies as a Plan C.
Plan A and B were quickly formed after further investigation of the DRCLAS (pronounced Dr. Class, David Rockefeller Center for Latin American Studies) Summer Internship Program (SIP) as well as Sustainable Development Programs. I applied to work in Latin America and Mexico, and with luck on my side, I got accepted into both programs. My first choice is definitely interning in Latin America so that I can join my friends and teammates on Refresh Bolivia (a student run organization here at Harvard College) after my internship ends. Fun Fact: Refresh Bolivia was founded by a current senior who will be heading to Harvard Medical School this fall!! He’s been my friend since my freshman fall, but now I’m just star struck by him!!!! Returning from my tangent, the real kicker is that my funding request was accepted as well! One of the main factors that initially attracted me to Harvard College was its incredibly generous financial support – both in and out of the classroom. Many have heard of Harvard’s renowned financial aid in the classroom, but during my first tour of the undergraduate campus, I was in shock that Harvard also financially supports its students in endeavors that make/keep us happy such as partying (safely of course!!!!) and working abroad!! I’m so beyond eternally grateful that my summer adventures will be partially funded so that I can avoid being an actual adult for that much longer by putting off organizing my finances. The plot twist (cue scary music here) is that my funding request was approved for the Mexico Sustainable Development program when I prefer Latin America. When I spoke to a few friends, they only worried me by emphasizing how inflexible the protocol for summer funding is. Thank goodness they set my expectations low because that only set me up for a higher rise after I spoke to the faculty in the DRCLAS and OIP (Office of International Programs) offices who are currently working so that my funding can be transferrable in between the two DRCLAS programs. Everyone affiliated with Harvard University has been so kind and helpful that I doubt I could ever be thankful or appreciative enough! I’ll definitely update when my summer plans are set in stone. For now, I can happily enjoy the present. Spring was here last week with temperatures in the high 60s(? ), but now Spring is just near as everyone busts out their puffy jackets with a pout once again. Also, HAPPY BIRTHDAY to our very own Jesse Sanchez!!! Double also, best of luck to everyone waiting on decisions tomorrow. My judgement day was April 1st (April Fools Day – which is pretty cruel) so consider yourself lucky! Know that the Admissions staff is really in an unenviable position because there are SO many qualified applicants! Keep your heads up and whatever happens, happens for a reason!